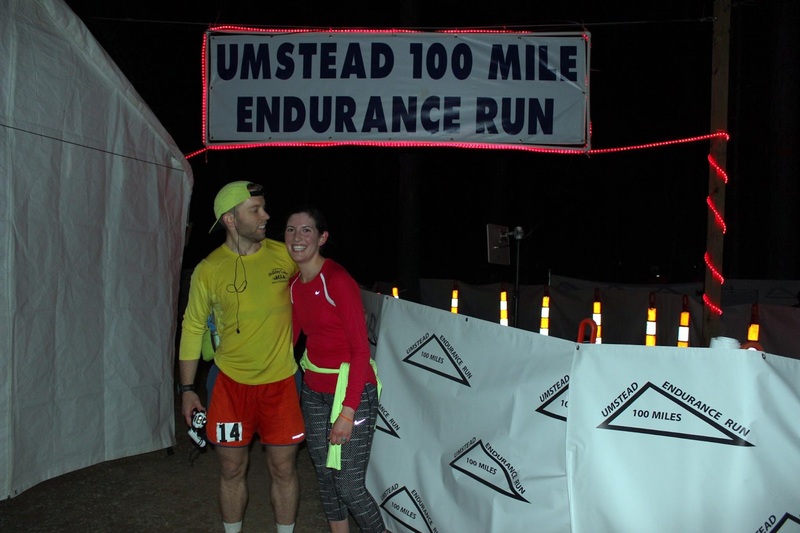 My Daily Ground: 2016 Umstead 100 Mile Endurance Run "Race Report"
Umstead 100 makes #families. 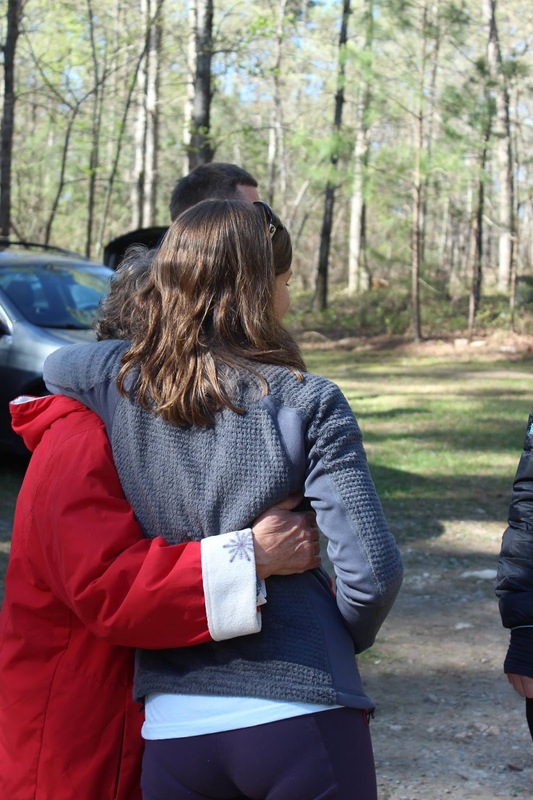 It was evident as I witnessed friends, now family, embrace warmly before departing that we had taken part in something special. The photos above embody the attitude of the weekend. Love. Support. Joy. Why else would we endure hours, sometimes days, of suffering? Jordan was there to capture the moments above perfectly. Before we climbed in our cars, we gave hugs all around. Hugs for congratulations. Hugs for appreciation. Hugs for new relationships formed. 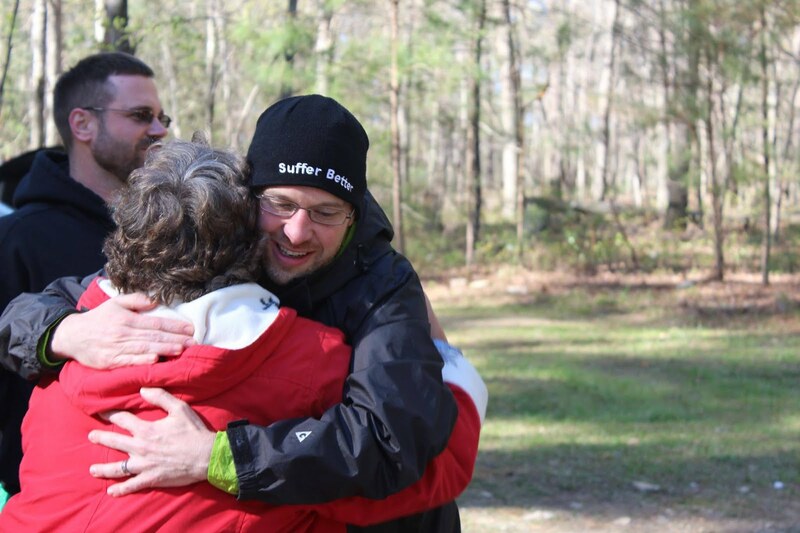 Hugs because together we had achieved so much more than getting four runners to the finish line. 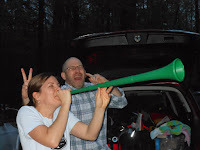 We stared failure in the eyes and laughed, smiled, danced, and vuvuzela'd our way to success! 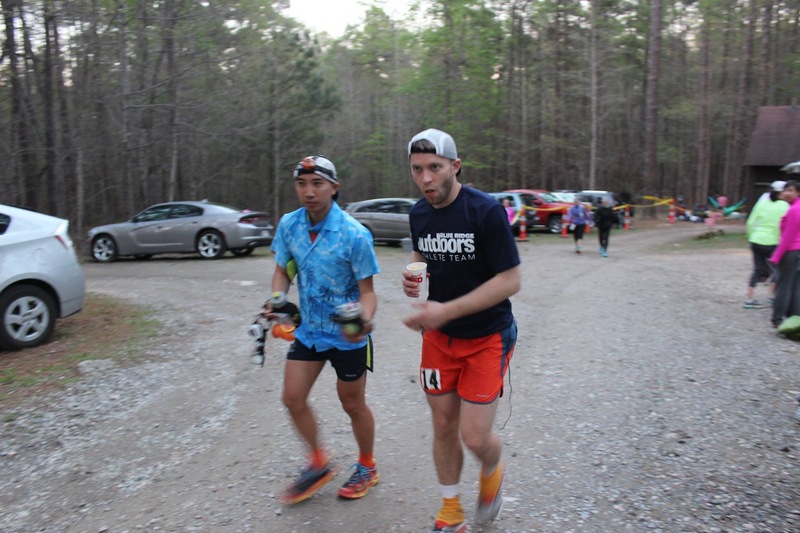 It has been two years since I've written a "race report" and this one will follow a similar format. There are a few reasons why I stopped writing this blog but the primary reason was the realization that what I'm doing isn't a big deal. 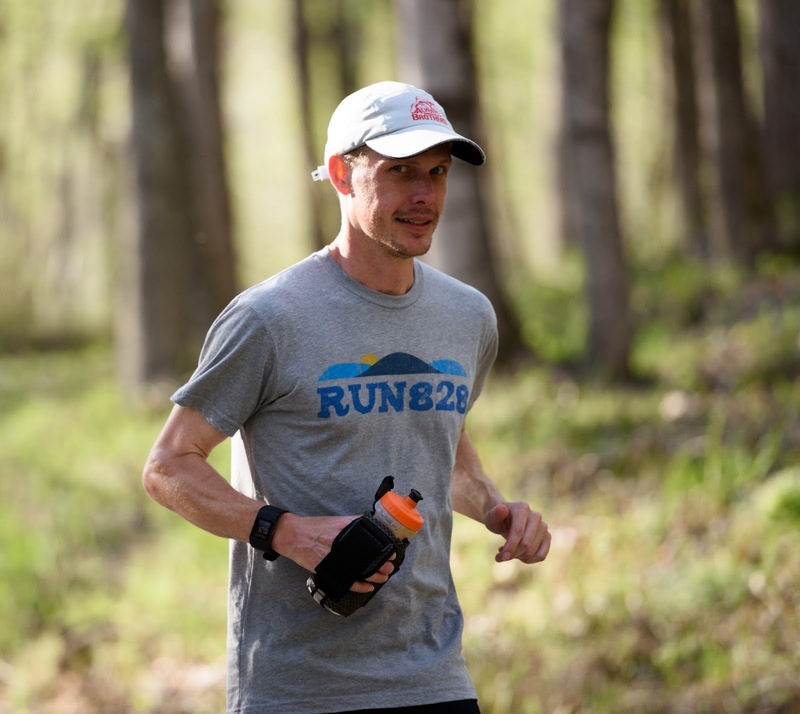 Plenty of individuals pursue long distance running. What IS a BIG deal are people who give up a weekend to help and support others achieve their goals. 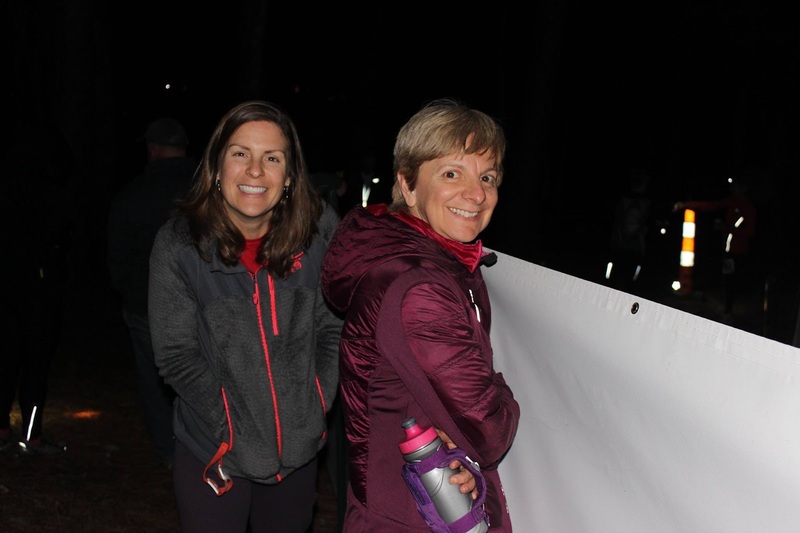 People who drive three or four hours to cheer on runners and pace friends at all hours of the night. 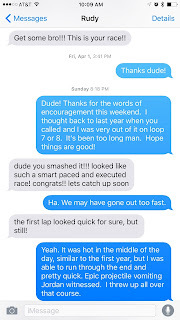 Those are the type of people we should be writing race reports about. THOSE people are a BIG deal! LINDA VICK! True confession. Linda was my undergraduate advisor when I was a mechanical engineering student at Virginia Tech. Numerous times I went to her office in a panic fearing the worse and there she was to keep me calm and reassure me everything was going to be okay. I affectionately refer to Linda as Momma Vick because of this. What better qualities could you ask for of a crew member at a 100 mile race? Linda not only drove down to support the four of us as crew but she ALSO VOLUNTEERED at the aid station halfway along the course and was there to tell me I looked strong as I came through her aid station later in the race. I know this was not true but thank you Linda for being an awesome friend, advisor, and crew member last weekend. Both Michelle and I are so appreciative for your friendship. 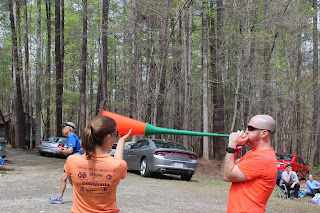 Linda is running the Blue Ridge Marathon next weekend and we intend to find her on course with the Vuvuzela! BUTCH!!! This kid has serious talent! Talk about clutch in a way that only #UltraVT could pull through. Butch ran an off the couch 50 miler with Royce. 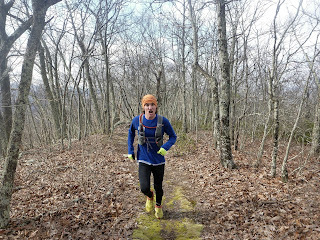 Butch is a seriously talented runner and a humble guy who basically made the pacing situation work. 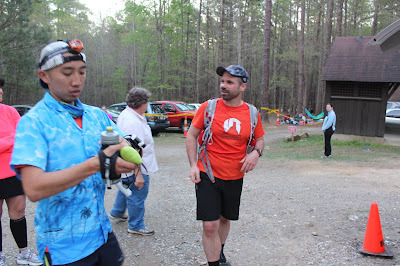 Things got a little messed up with the pacing schedule, which was totally expected, because 100 miles is a long way right?!? 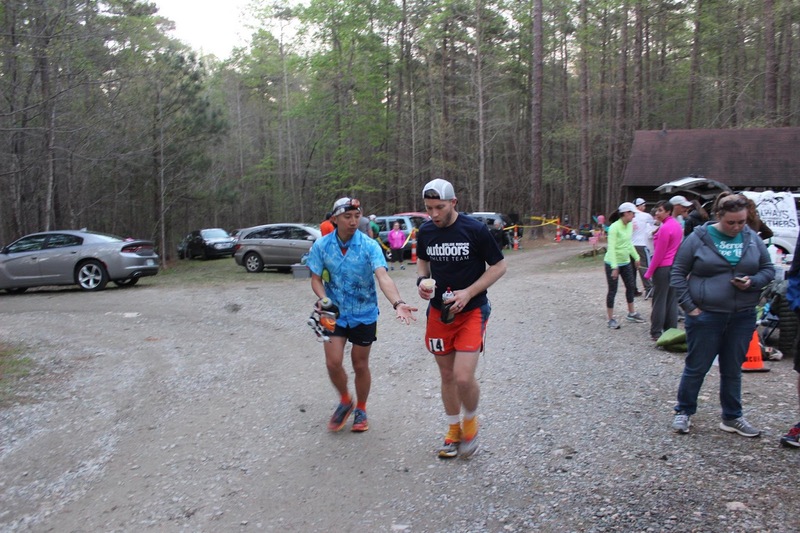 Josh Starner stepped in for lap 6 pacing duties for me and it is because of Butch that this worked and didn't completely shatter all pacing responsibilities! I felt the need to include some typical BUTCH face photos to give you a better feel for Butch's humble intensity. Chris and Julia! You guys win the award for the longest drive! Every time I came into the aid station there you two were with smiling faces. 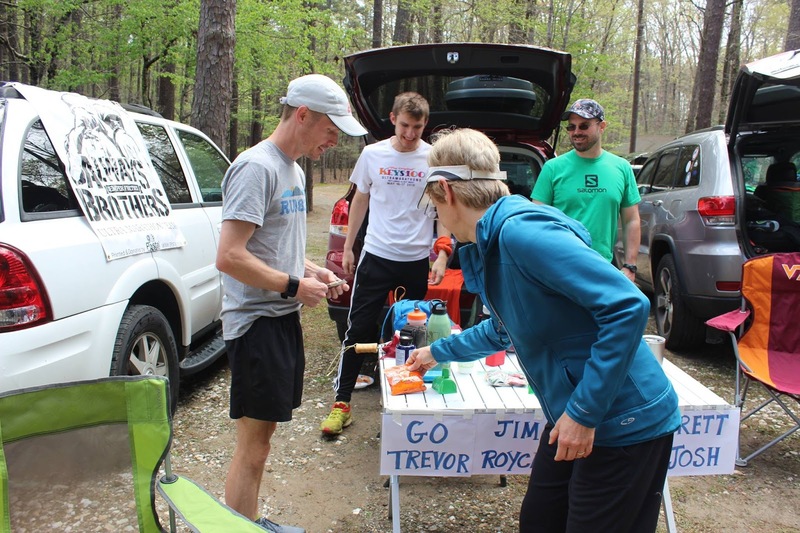 Chris, Trevor and I were joking a week out from Umstead that you had as many 2016 miles as Trevor and I and that you could be running Umstead. It was awesome that your rocked out two laps with Stewie and helped pace him to a PR. He's already talking about your magic and requesting you for Grindstone this fall. I can't wait for you to get up to Blacksburg for your first Catawba Run Around #CRA. Chris is a card carrying member of the #BadIdeaClub and embodies the #ExploreYourFaceOnFire attitude. He also participated in the inaugural meeting of the bad idea club completing the New River Trail 50 mile run last fall. Jill! In case no on has told you today, YOU'RE AWESOME!!! I came in after lap two slightly unhappy with a blister that had developed on my left foot. 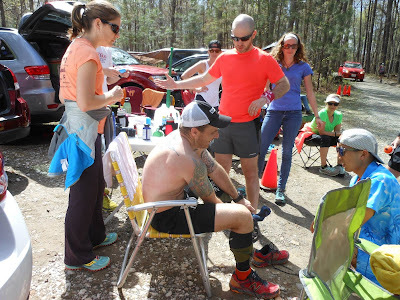 I wondered going into the race whether a spot on the inside of my left foot was going to be an issue. 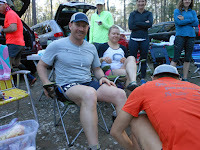 After hitting the aid station, I was persuaded to change my socks (a great idea) and reluctantly sat down in a chair, only after stating aloud a power phrase "Beware of the chair!" When I took off my sock, I found a pretty large blood blister that needed to be addressed. After consideration, the used fork on the aid station table wasn't going to work and without pause, as if in a movie, a knife slides in from behind me on my left side. Jill was there to save the day! With a little hand sanitizer for sterizilation (?) I did through-and-through and drained the blister. I didn't have to worry about my feet for the rest of the day. 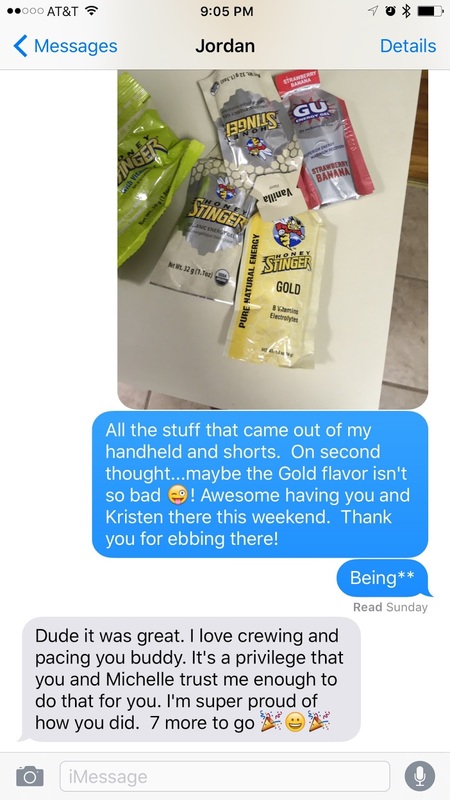 Jill, thank you for letting us borrow Josh for numerous weekends throughout the winter (but really...you're welcome!). Jill and Michelle ran the 8 miler last year at Eastern Divide. We wish we could have them here in Blacksburg but Boone will have to do for now! LOIS!!! It's no wonder G$ is so awesome! She's a chip off the old block! (not calling you old here Lois) If you were to have a potluck, Lois would bring the awesome-sauce! And some sweet signs! 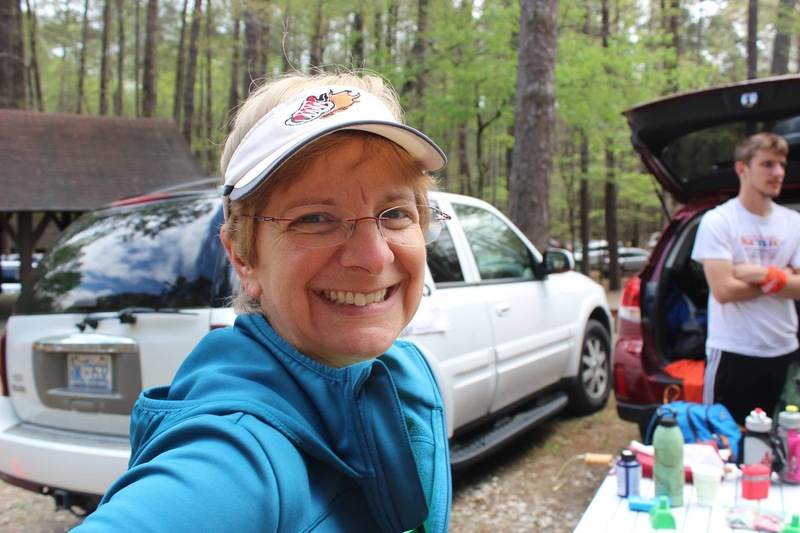 Lois has been at Umstead for the past two years and is an awesome crew member! 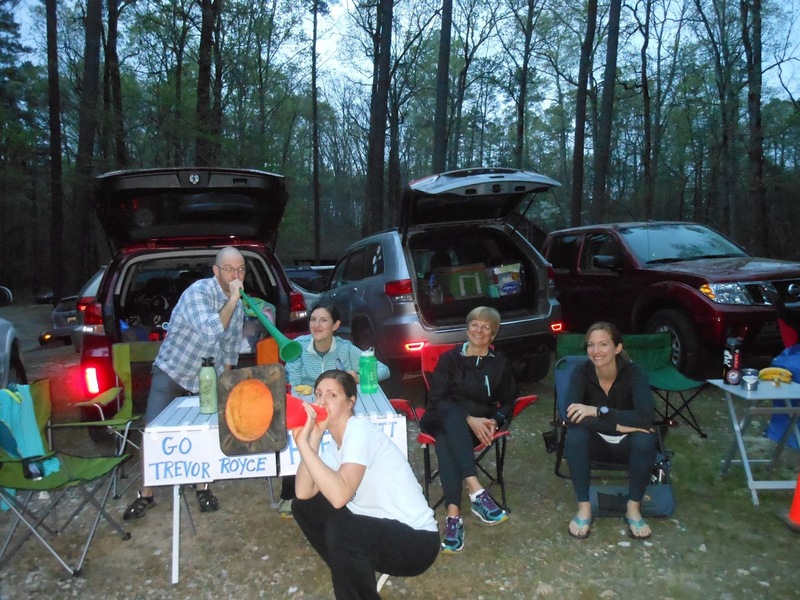 She even stayed up for Trevor to finish last year (I didn't make it to the finish line for Stewie last year). 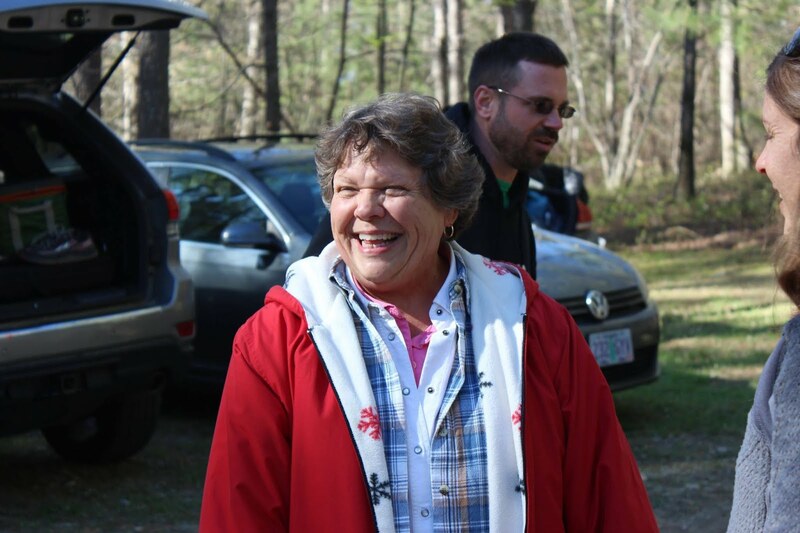 Lois, thank you so much for being there and being the awesome Mom you are! You're one of the coolest moms around. The photos you took are awesome and you kept everyone on the interwebs informed all day. PAUSE!!! DID I MENTION HOW AWESOME OUR CREW WAS?!?!?!?!?!!!! (Josh) STARNER!!! DUDE. I'm Sorry. You got me at my worst during the race. I was in a dark place. Probably pretty glazed over. Possibly swerving all over the trail. Non-responsive. And overall not a great person to be running with. If there was an MVP of crewing duties for VT Ultrarunning you would win it at every year. 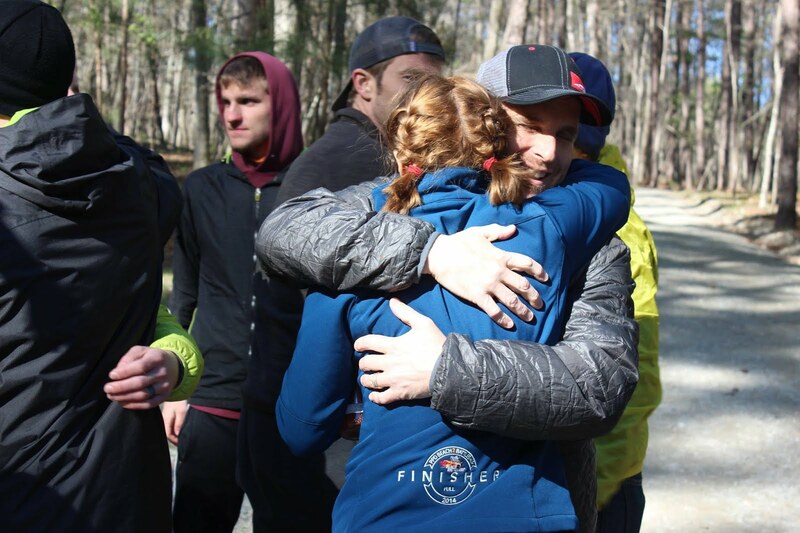 Your kindness and willingness to do whatever a runner needs is unparalleled. 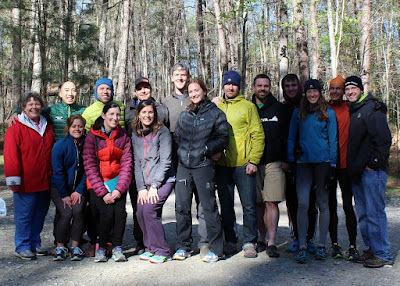 Thank you for the generosity of your time and being at Umstead. I can honestly say I'm not sure I would've made it around lap 6 without you! I'm so stoked to watch you tackle your first 50 and 100! MAO (Sean) MAO! I'm so glad you tapped Trevor on the shoulder to ask if you could join at pub run. Your ENTHUSIASM IS CONTAGIOUS. You were on point all weekend. Always willing to help. 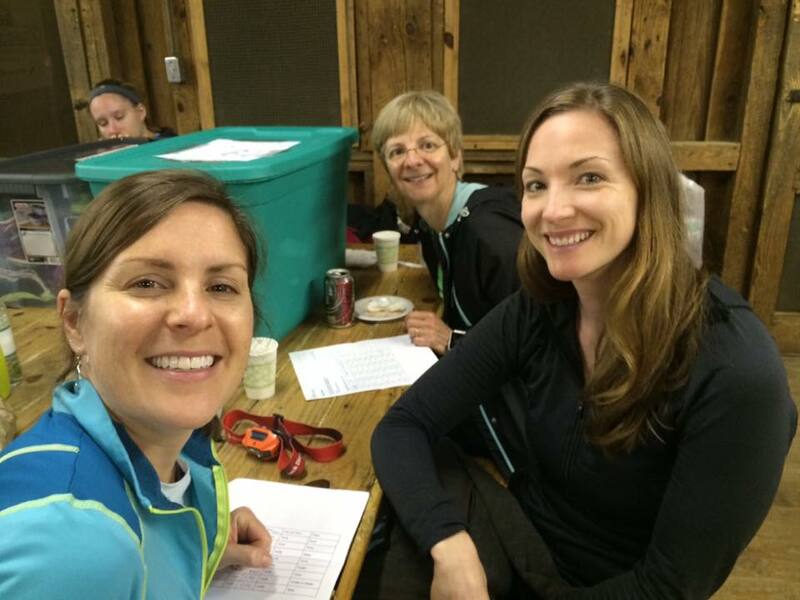 Keeping what could've been a heavy and stressful pre-race day light and jovial. Deb - your husband is an amazing man and thank you for letting us borrow him for the weekend. Also, Michelle is going to need the peanut butter ball recipe. "MMMM....this is so good!!!" On a serious note though, watching you transform into a trail beast has been inspiring and a breath of fresh air. 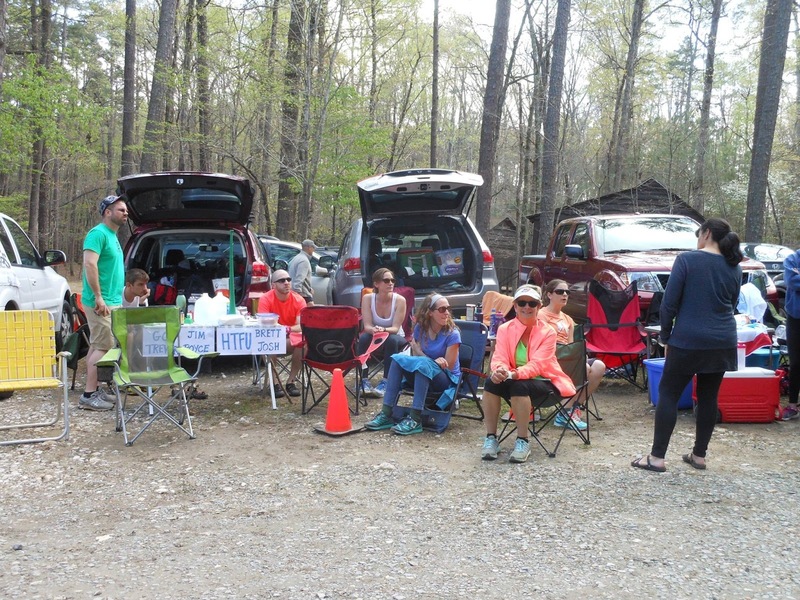 Not only was your DEBUT marathon seriously impressive but then to turn around and lay down the time you did at Holiday Lake. This is just the beginning. 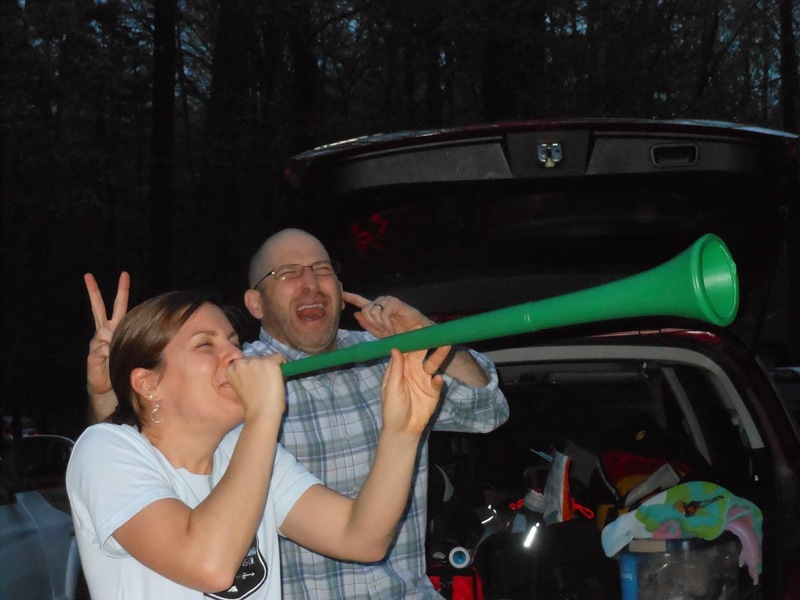 Thanks for taking charge on the vuvuzela duties. Your horn skills are superb. "Jordan knows me better than most people, he knew that I’d let myself be content with finishing, rather than pushing myself to finish higher. He knew exactly what to tell Michelle and how to push me, without physically being there to push me. It was as if he was out there with me on lap 8, when he was back at headquarters aid station waiting for me to finish." Jordan has been there with me every year. 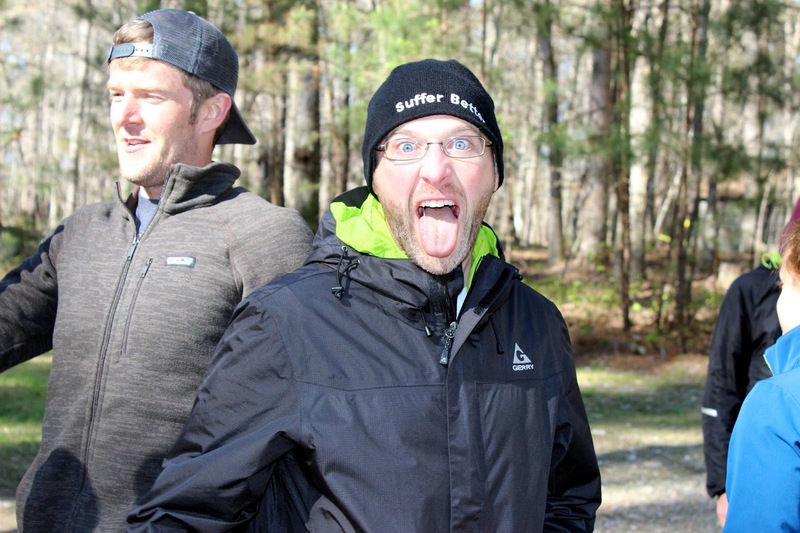 It wouldn't be Umstead without him. 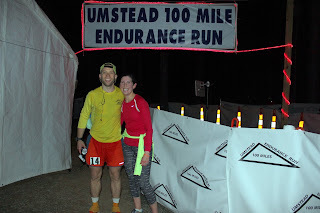 He kept me fueled in the dark miles of a 100 miler and kept my spirits high providing encouragement and compliments. 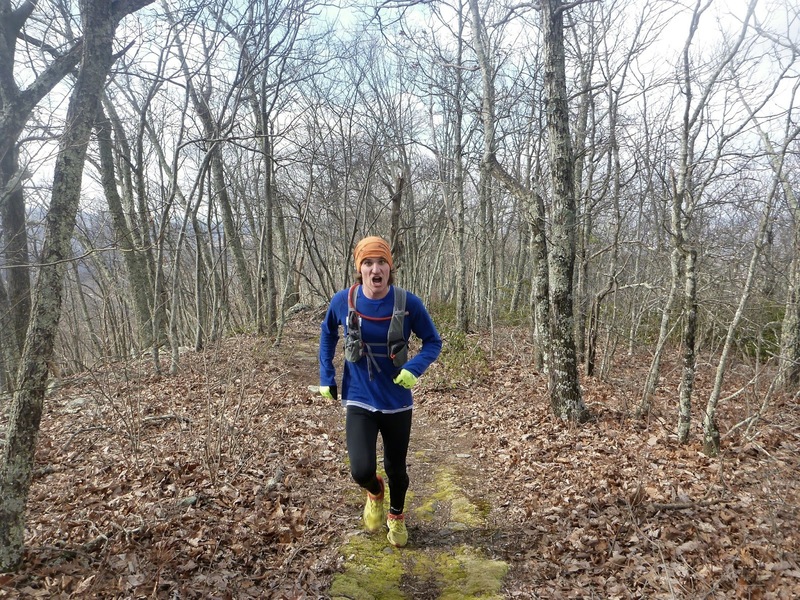 If there were a tour guide of SWVA mountains it would be Jordan. 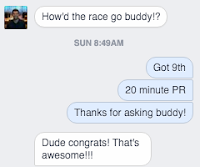 He is a far better friend than I deserve and I hope we run until we're old and pushing the 30 hour cutoff. 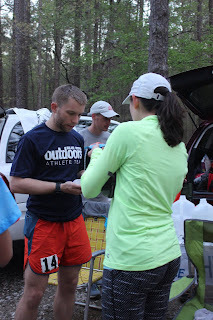 You make me want to be a better runner, person, friend, and husband. You are a huge role model for me. Thank you for being my friend Jordy! Fun fact: Jordan is solely responsible for the increased usage of emoticons among our group. There's a correlation between the number of emoticons used and happiness of the individual. Jordan uses a metric crapton of emoticons. 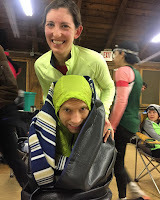 Below: Jordan has my jacket and headlamp and is waiting for me to return from HQ aid station. Did you notice his shirt?!? He's a boss. And a beast. Seriously talented and so proud to call him my friend. If you look at all the crew photos above, you'll notice it's Jordy taking care of both Trevor and Royce's feet. I can't think of anyone else I'd want to projectile vomit in front of! Kristen, thank you for being there and capturing moments behind the camera! 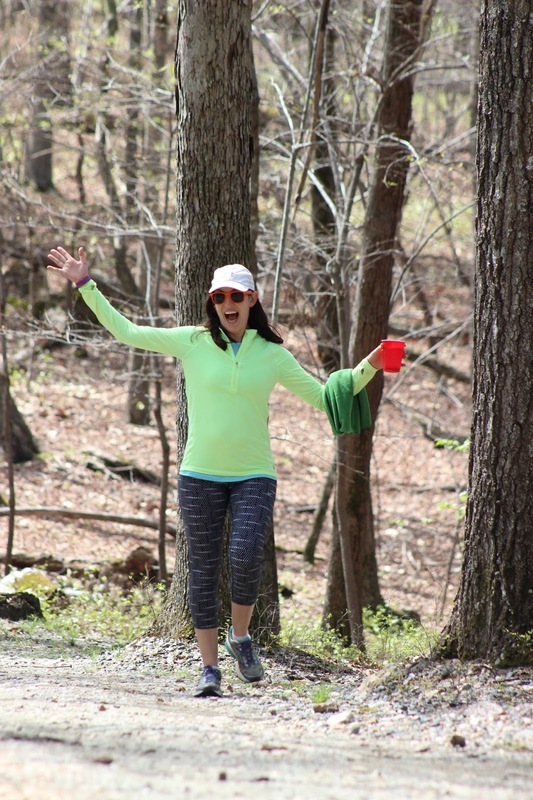 I'm glad you got the opportunity to witness Umstead firsthand. Michelle! My Loving Wife Sherfy! I cannot begin to express my gratitude for your support in this endeavor. 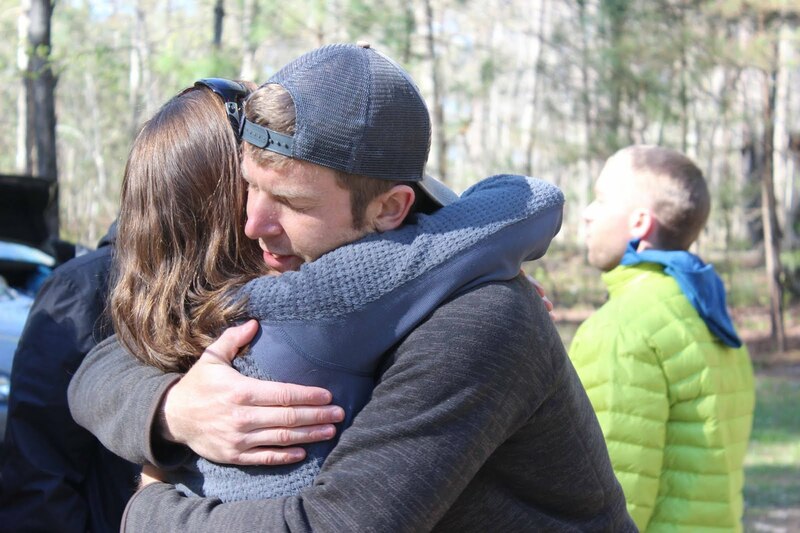 Of all of the Umstead moments over the past three years, none compare to RUNNING the last lap of this years race with you. You've supported me in so many ways over the past 7 years but last Saturday I saw a side of you I've never seen before. On lap 7, I told Jordan I was ready for lap 8 to be a victory lap and wanted to soak in the day. I told Jordan that there was no one I would rather run lap 8 with than you. 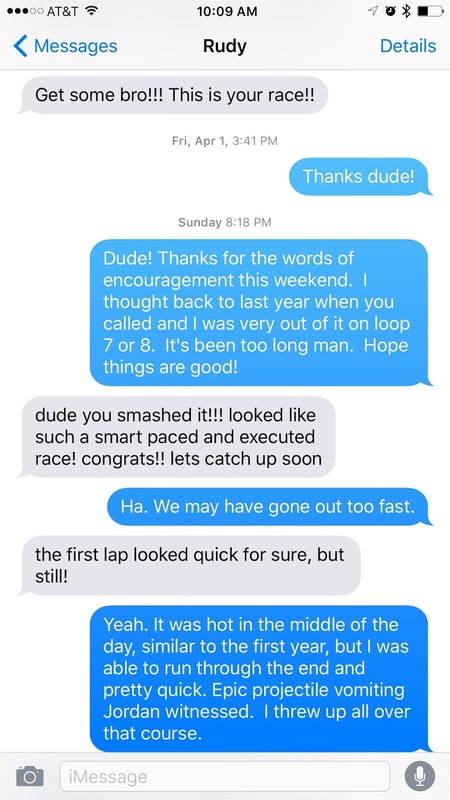 I told Jordan that the only reason that I was there on lap 7 was because of your support. Your support all winter during long training days. Your support preparing healthy meals every week for us to eat. 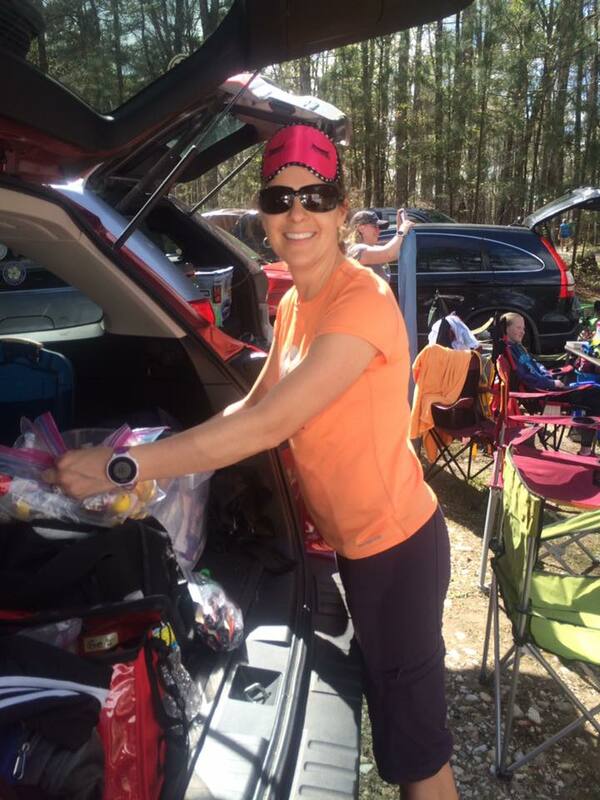 Your support of many Saturdays apart with me training in the mountains because you knew it would help me be successful at Umstead this year. But you didn't let me settle for victory lap. You didn't let me walk the last lap. You persuaded me ever so slightly to want more than just finishing. You wanted more for me when I didn't. You didn't complain once. You ran hard and were the perfect pacer. 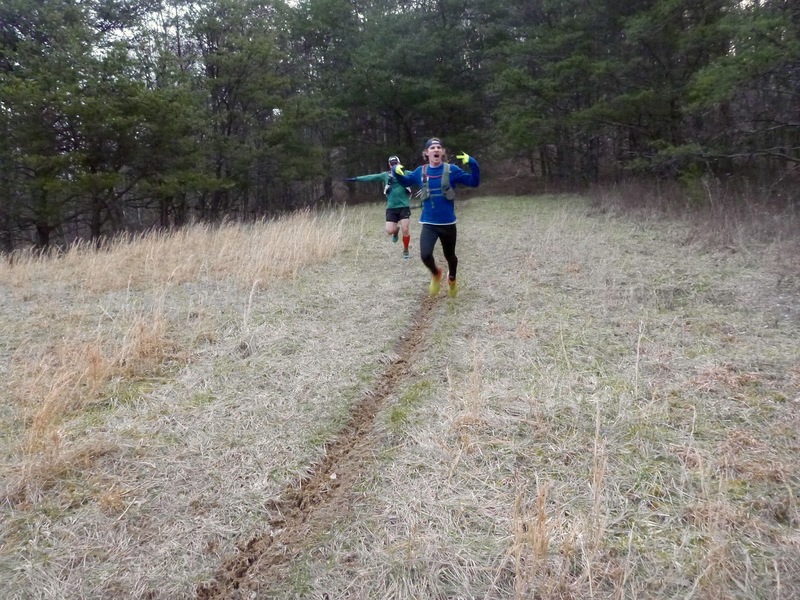 I'm not sure we've ever been more in sync on a run together. 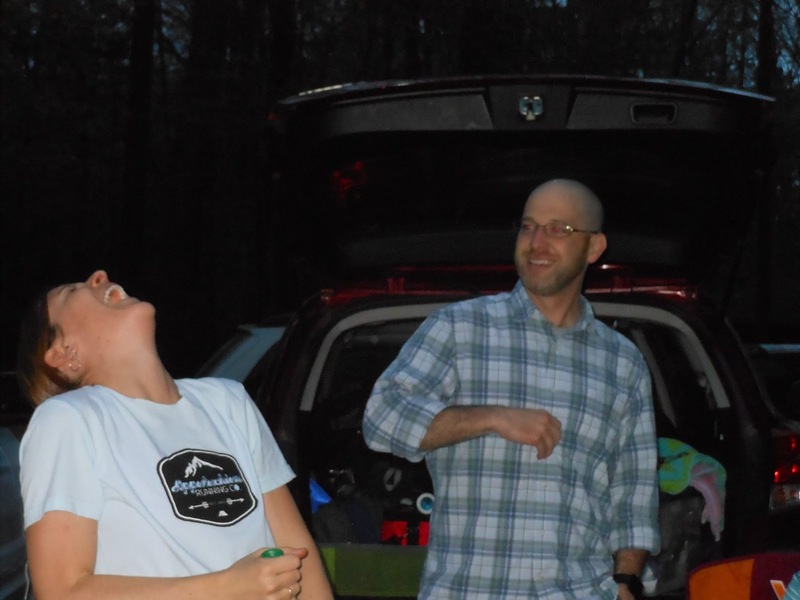 Not only would Umstead not have been possible without you, it wouldn't have been fun without you. All day long you were ready to get me whatever I needed to get back out on the next lap. You led our crew calmly and kept our pacers organized and made the day work. I am so damn proud of you. I am so glad to be on this journey of life together. SO Richmond...?!? EVERY VOLUNTEER! Rhonda! The #UmsteadFamily. There’s a lot of selfishness involved in setting the goal of a 1000 mile buckle. Perhaps my selfishness is fear in what will happen after the Umstead party is over? 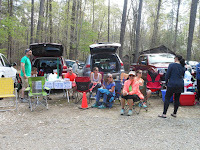 The first year we were at Umstead, we rolled with a fairly small crew, only Michelle and I were there on Friday and Rudy and Jordan drove down on Saturday. 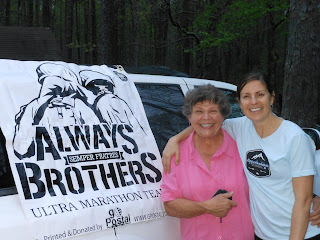 We were welcomed by other runners and crew (Rick and Tammy, you guys seriously rock and are just so darn nice! We feel privileged to call you guys friends). I vowed not to run it again because I could not imagine the day going better or having more fun. But the draw of the #UmsteadFamily convinced me to sign up again and run it last year. Last year was the first year that we knew folks before we arrived at the race start. 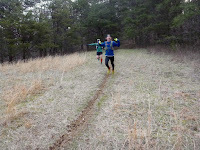 We met Lois and Jordan returned AGAIN for pacing duties, running laps 7 AND 8 with me. Josh came and ran with Trevor and fun times were had. The race just has something special about it. Perhaps it's the lap setup that makes headquarters aid station and crewing so appealing or the unparalleled welcome that crew receive by the race staff. 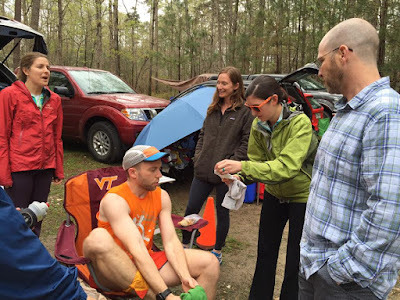 No other race treats runners and crew equal. Rhonda, thank you for continuing the awesome event Blake created! Volunteers, thank you for being out there in all hours of the night. For pacing random people to help them achieve their goal. You guys rock! Thank you to the countless photographers (Ben Dillon, Hope Squires, G. King, Dennis Geiser, and many others) that stand out on the course and take photos of runners to use as FB profile photos or for blogs like this one. Friends and family following along from all over. Thank you for your positive words, congratulations, and words of encouragement. It is easy to pass over the Like button on FB or to think..."he's running that again?!? We get it. You run" (#HatersGonnaHate) but knowing we had people following along, subscribed to text messages, and supporting from a far kept us going out there. A big shoutout to our RunAbout Pub Run family. We look forward to seeing you guys every Wednesday! It's become my favorite day of the week. There you have it! 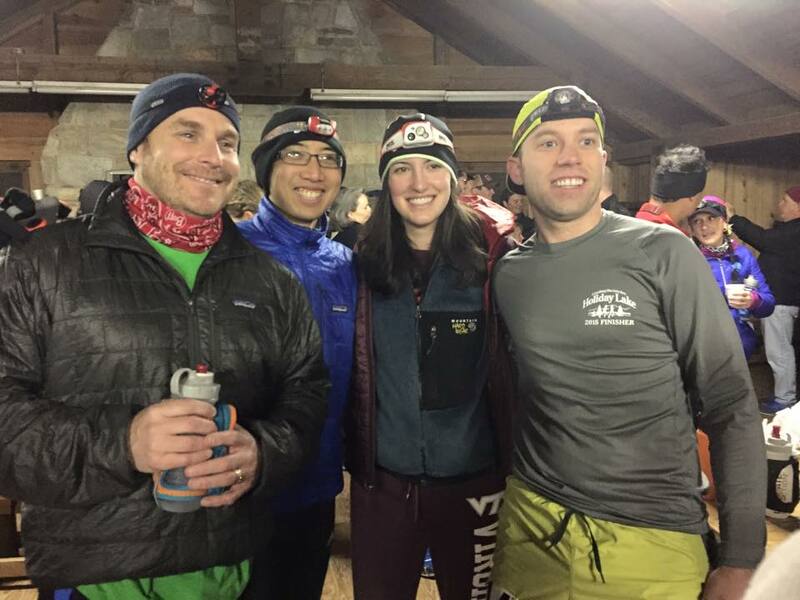 It was an awesome weekend of running with friends, now family. Congratulations to all finishers and participants! 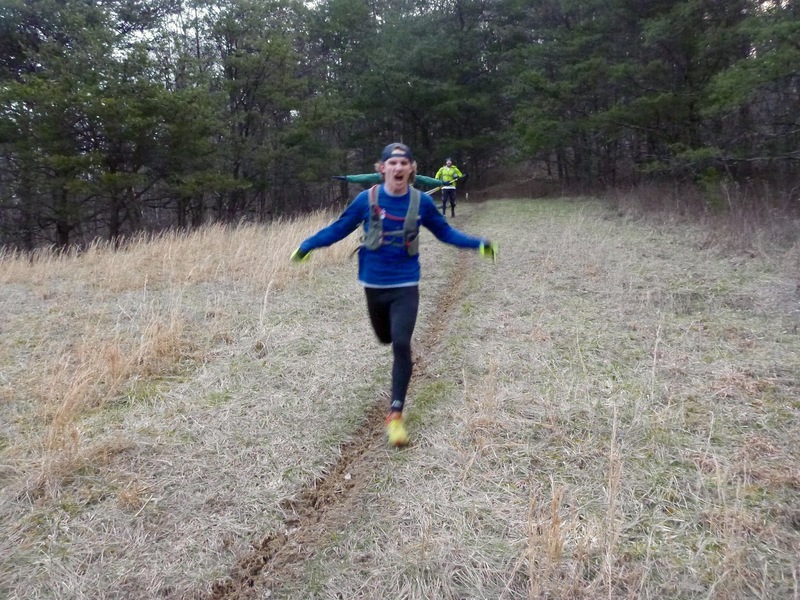 It takes guts to toe the line of a 100 miler, finish or not. 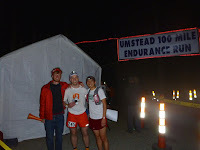 Royce and Josh, welcome to the family and selective group of 100 miler finishers. I hope your Umstead experience lived up to the hype! Stewie, I'm so damn proud of you. I think of you like the brother I never had. Congratulations on breaking 20 hours! 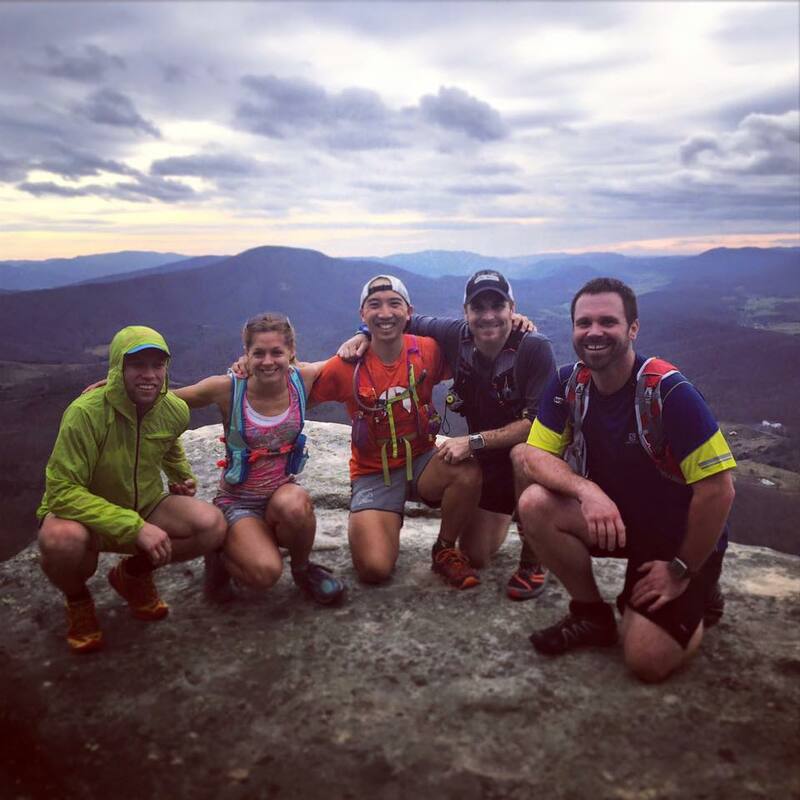 You inspire all of us and I don't hesitate to say you that you are the mayor the Blacksburg running community! 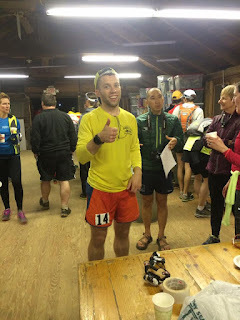 I may post a detailed race report full of geeky runnerd numbers and description of how things went down but everything above is the important part, the part WORTH reading. 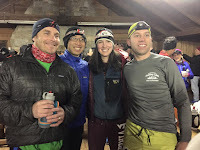 I do want to write a blog post on why signing up for ultras with friends and training with friends is awesome but... we'll see if that happens. Posted by Unknown at 4:36 PM I'm reading from MyDailyGround: 2016 Umstead 100 Mile Endurance Run "Race Report" Tweet this!